July came, but so did poor weather, and July will go down as the poorest month as far as weather is concerned since our arrival in the UK. Although 23 missions were briefed we flew 17 and all due to the wrath of “Jupiter Pluvious”. However, the majority of the missions were of the deep penetration type. It will be a month long remembered as on the 20th we had completed 95 sorties, this, together with our 5 AZON missions completed our 100th sortie in the short space of 5 operational months. Our record for the previous months had been outstanding. 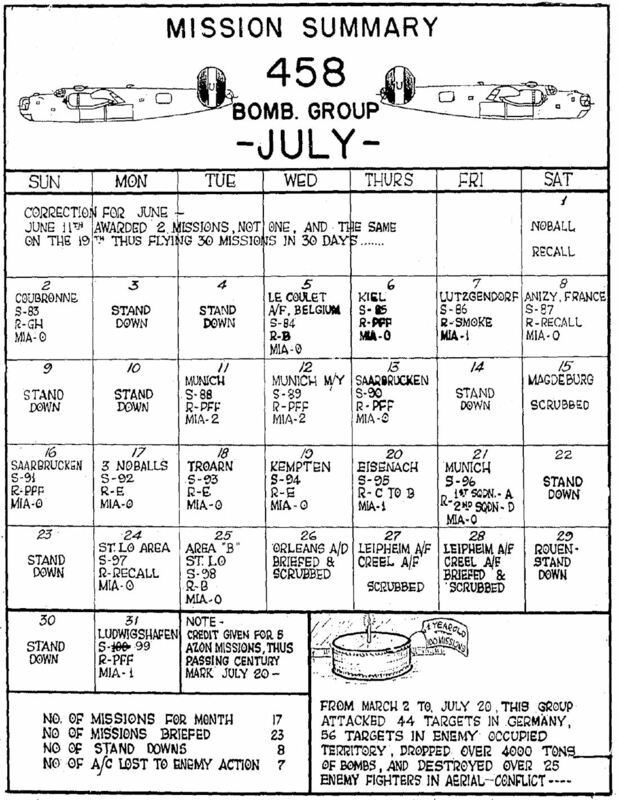 The Group led the Division for April, May and June in bombing accuracy, but dropped to third place in July. However, we feel confident that we will regain our standing for the month of August. Our first mission of the month was on the 1st where the formation took off to bomb a NOBALL target. The weather did not permit bombing so the formation was recalled. On 2 July we were alerted and assigned as a target the NOBALL installation at COUBRONNE, FRANCE. Twenty of our A/C were over the target led by Major HENSLER and Capt. HINCKLEY. 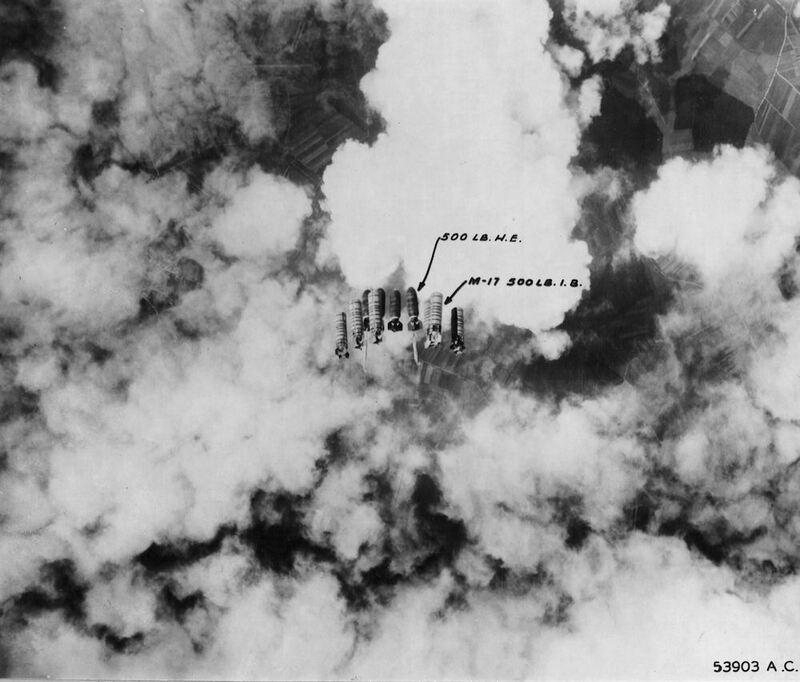 Although the target was obscured by 10/10ths clouds, the formation dropped 478x250 GP’s through the aid of GH equipment. No E/A were encountered and the flak was meager and inaccurate. Sortie 83 was chalked up on the sortie board. On the 3rd and 4th we were stood down, but took up the battle again on the 5th by attacking the COULET A/F in BELGIUM. Although 12 of our A/C were dispatched, only 9 were over the target led by Major HENSON. Although the Continent was covered by 10/10ths clouds, we did get a break over the target when the clouds shifted and we were able to drop visually a load of 340x100 GP’s with good results. 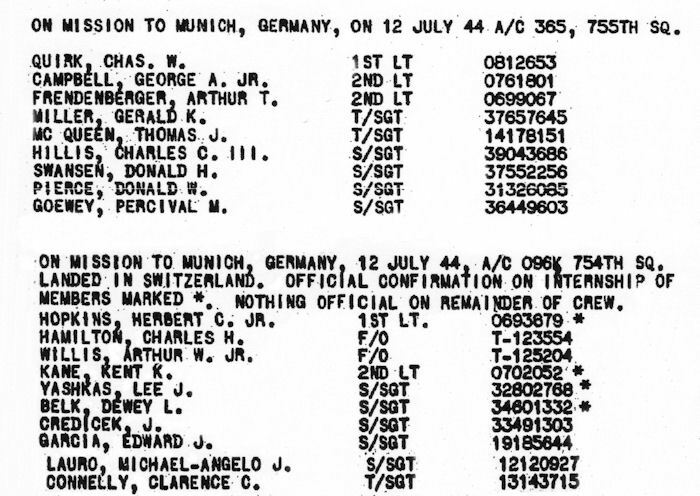 No E/A were encountered, and the only flak seen was over the target. Sortie 84 goes on the ever increasing record. A deep penetration was ordered for the 6th, the target being the KRUPP WORKS at KIEL, GERMANY. Twenty-eight of our A/C were dispatched under the leadership of Major JAMISON (left) and Capt. OLLUM, with 21 actually dropping. Due to cloud coverage and smoke screen, PFF equipment was employed and the results of the 252x500 GP’s dropped was unobserved. One would expect to meet the vaunted Luftwaffe on such a penetration but no, nary a one was seen. The only protection offered the target was intense AA which was generally fair to accurate. Chalk up Sortie 85 boy! An all-important RR BRIDGE at ANIZY, FRANCE was our assigned target for the 8th. Twenty-two of our A/C were dispatched with 21 receiving Sortie credit, but the formation was recalled while over the target due to 10/10ths clouds. However, a Group Sortie was awarded our efforts and Sortie 87 was added to the board. Mixed load of H.E. 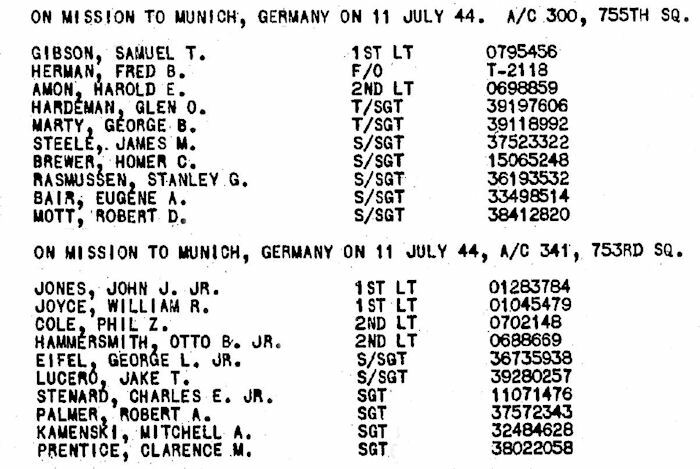 and Incendiaries dropped in the attack on Munich, Germany. Sortie #90 was completed on 13 July with our attack on the M/Y at SAARBRUCKEN. Of the 22 A/C dispatched, 16 were over the target led by Major WILLIAMSON, Capts. CHAMBERLAIN and HINCKLEY, to drop 48x2000 GP’s through the aid of PFF equipment without observed results due to undercast. We were grounded by bad weather until the 16th when we made a repeat visit to the M/Y at SAARBRUCKEN. Twenty-four of our A/C were over the target led by Capts. OLLUM and GLENN to drop 287x500 GP’s on the target with the aid of PFF equipment with unobserved results. We think that this month will go down in the history [of the Group] as the largest number of bombings through the aid of PFF. Weather or not, we have shown the Hun that 10/10ths clouds offer no obstacle to us when we pay him a visit. No E/A were encountered, and the [flak] barrage at SAARBRUCKEN was successfully avoided by a turn after bombs away, so none of our A/C suffered battle damage. 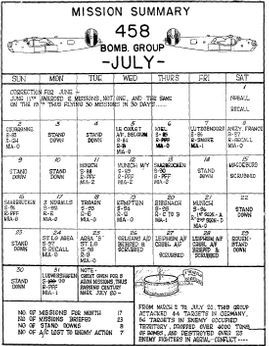 Three NOBALL targets were to feel our might on 17 July, chalking up Sortie 92. 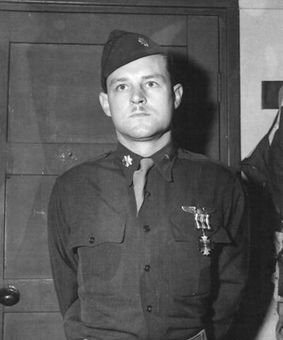 Twenty-six of our A/C were over the targets in three sections led by Major JAMISON, Capt. OLLUM and one section flying as a composite squadron of the 466th. All three targets were hit with good results as 142x500 GP’s and 336x250 GP’s hit in the target areas. No E/A encountered, neither was any flak directed at the formation. On 18 July we were out on force in a tactical mission in support of the ground forces just west of TROARN, FRANCE. Our effort coincided with other large scale operations of the same type by Tactical Air Forces, dive bomber units and the RAF. Twenty-four of our A/C were dispatched under the leadership of Col. ISBELL and Capt. FREEMAN. Our first section did not drop, but the second section blanketed the area with 480x100 frags. Seventeen of our A/C suffered minor battle damage from flak, but no E/A were encountered. Sortie 93 was chalked up for our efforts this day. A deep penetration was our lot on 19 July, Sortie 94, when we were dispatched to bomb the MESSERSCHMIDT FACTORY at KEMPTEN, GERMANY. Of the 24 A/C dispatched led by Col. ISBELL and Capt. 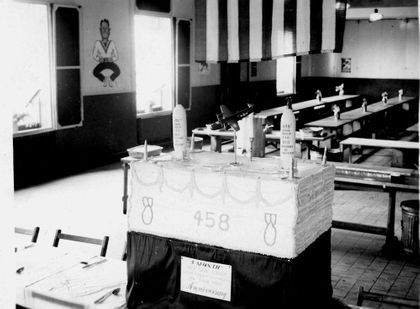 HINCKLEY, 18 bombed STRASBOURG with unobserved results, and another bombed the M/Y at PRUM, hitting the tracks and train in the yard. Intense and accurate flak was encountered over STUTTGART, inflicting minor battle damage to six of our A/C. yards leading into work shop, carriage repair shop and north end of wagon repair shop. Other bombs dropped on residential area to NW and south of MPI. SECOND SQUADRON – Main impact fell in residential area and fields about 1000 yards NW of MPI. Our mission of 24 July was another ticklish, pin-point, precision job in supporting the ground troops in the ST. LO AREA. 35 of our A/C were over the target area but it was deemed inadvisable to drop the bombs as the weather was poor and our troops were directly beneath us. 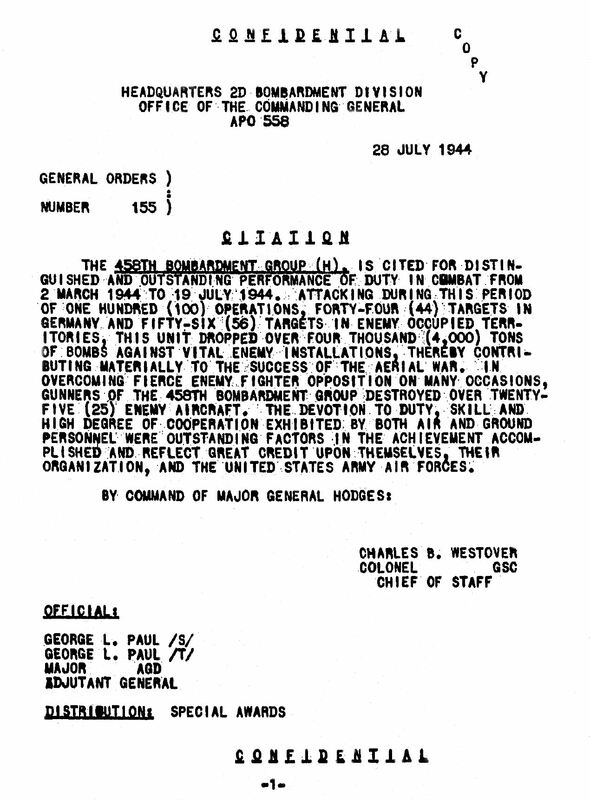 It was a disappointment to all, but we made up for it on 25 July when 36 of our A/C, led by Major LAROCHE, Capt. BROOKS and Capt. 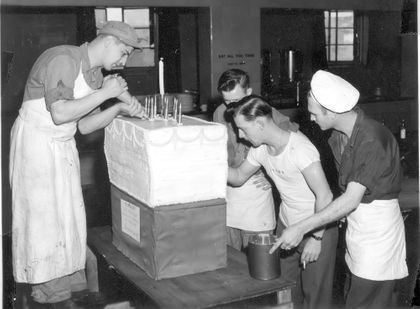 CHAMBERLAIN succeeded in accomplishing the task assigned on the 24th. The formation dropped 1867x100 frags in the assigned area, and it would be foolish to try and put on paper the devastating effect this bombing had on the German troops. Never in the history of modern warfare has the forces of air and ground been so closely connected. The Group did an excellent job today and everyone from the KP’s to the combat men feel a great satisfaction for their part played.